My New Favorite Place and a $3 Lunch! 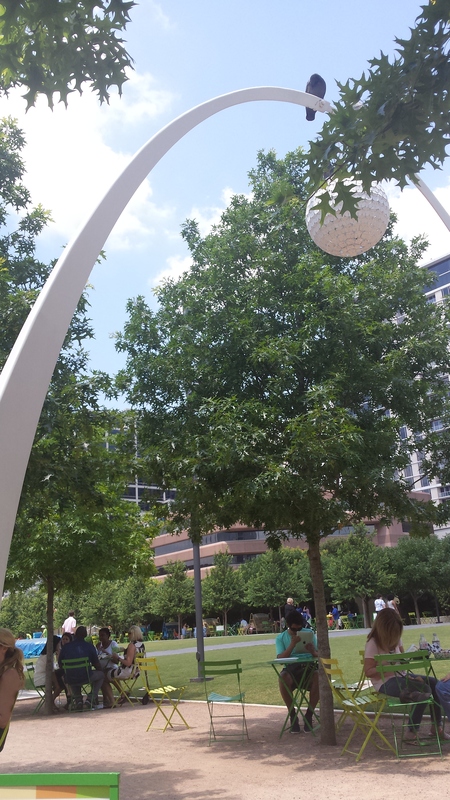 One of my favorite things about living in Dallas is the fact that I work downtown. I don’t know what it is, but I love all the big buildings, all the people walking around in business clothes, the surprising amount of flowers everywhere outside- it’s all great! I try and go on a walk every day, just to get some fresh air and stretch my legs, and now that it isn’t raining anymore I have been able to get out and explore some more areas around my building. 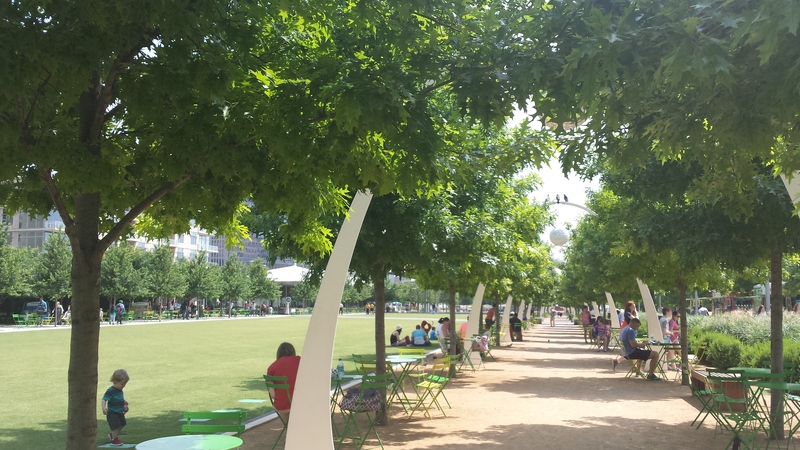 I headed North out of my building a few weeks ago, walked a few blocks, and found my new favorite place… Klyde Warren Park. It’s a tiny little park that is over the freeway, and this place is awesome! They have food trucks every single day, they have free fitness classes most days (tai chi, yoga, pilates, Zumba, it’s great! ), there are restaurants, a yard area where you can play, a children’s play area, games you can play, and on top of that, it is BEAUTIFUL! The walkways are lined with small arches complete with lighted globes (a nice little reminder of St. Louis) and the park is small enough that a walk around it is the perfect quick escape from my desk without being gone for too long. I went there with some coworkers for lunch (to choose from the 10-ish rotating food trucks that are there daily!) 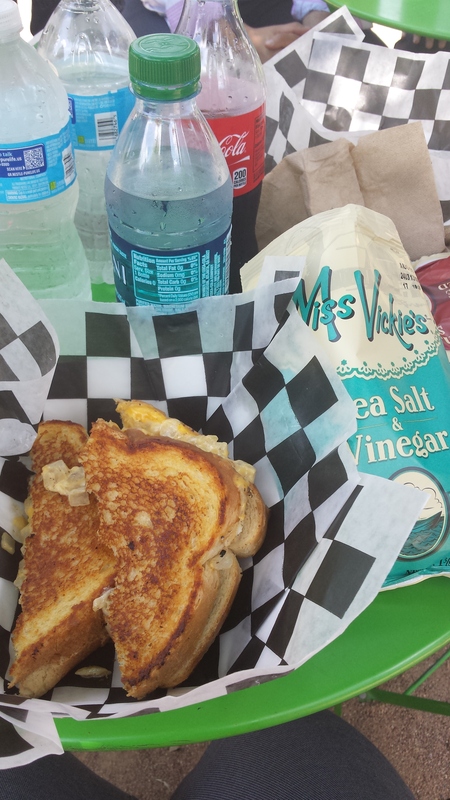 and decided that I wanted a grilled cheese patty melt from Ruthie’s (a grilled cheese food truck. Delish). While ordering, I decided that sure, I would splurge and get chips and a bottle of water, too. Why not? I got out my card to pay, expecting the total to be about $11 (MAN food trucks are EXPENSIVE!) and the total was $3. “Ummm, I ordered a patty melt, too.” “Did you get the chips and water in there?” “Are you sure it’s only $3?” Apparently it was national cheese day, so the food truck was selling ALL sandwiches for only $1! What a great surprise! And that sweet deal made it all extra delicious! THREE DOLLARS!!!! It seriously made my whole entire day!